TAMPA, Fla. (FOX 13) – For some of the men packed into a plane wearing parachutes, it’s an unexpected return to jumping. “When I retired out of special operations, the first thing you do is say I’m never going to jump again,” laughed Scott Neil, who spent 25 years in the Army, 17 of them in special operations. 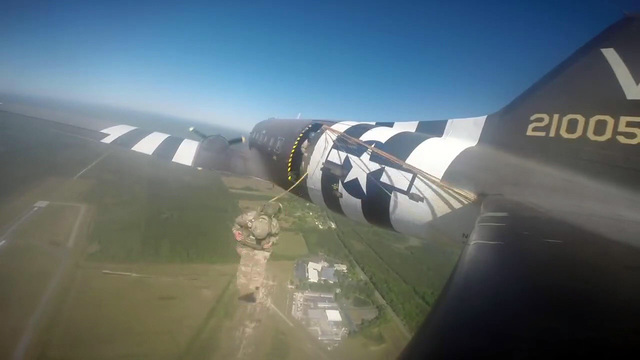 He and his friends jumped from a vintage World War II airplane, practicing for the jump they’re planning in June when they travel to the D-Day anniversary. This year marks 75 years since Allied forces landed on the beaches of Normandy on June 6, 1944. Much less famous are the secret landings that led up to D-Day. Members of the Office of Strategic Services, or OSS, were sent in ahead of the invasion. “They were small teams that were sent behind lines. Many were women. They would enable the French Resistance. They could communicate battle positions,” explained Neil. They’re the kind of missions that are familiar to Neil, who with some fellow veterans, owns American Freedom Distillery. Some of them were among the horse soldiers dispatched to Afghanistan after 9/11. They were special operations soldiers and CIA agents with skills handed down from those OSS special operators who went in before D-Day. Neil says their trip to Normandy will honor them. Their plan is to jump on June 5, a day before the anniversary, to call attention to the service of those who secretly landed in Normandy helping clear the way for D-Day.